There is no additional bibliography for this chapter. There are several key thoughts expressed in this chapter that I hoped would prepare readers for the book’s content. They deserve a bit of elaboration and, in some instances, further explanation. I made the comment in the book that we’ve been trained to think the true context of the Bible is the history of Christianity. That’s the truth. It’s also understandable. But any context other than the one that produced it is foreign to the Bible. I’m not anti-creedal. I subscribe to the basic creeds of Christianity (e.g., Apostle’s Creed, Nicean Creed). I just don’t believe that creeds serve any role in exegesis of the biblical text. While few evangelicals would actually say that we ought to use creeds to do exegesis, a mindset consistent with the notion isn’t uncommon—the idea that creeds should guide the way we interpret Scripture. I disagree. The text needs to produce our belief statements; our belief statements should not inform the text. More positively, creeds are useful orienting tools. By design they are brief distillations of select points of theology. They are inherently incomplete, both in what they touch upon and what they say about the items they do cover. That’s obvious to anyone familiar with them. What isn’t so obvious is the effect this has on people. There is a tendency, for example, to presume that is something isn’t delineated in a creed it is of lesser importance to biblical theology. I trust that those who have read Unseen Realm know in very demonstrable ways that just isn’t the case. While something in a Christian creed might be more important than an item excluded from a creed for the purpose of identifying oneself as a Christian, it isn’t at all the case that an issue excluded is less important for understanding the worldview of the biblical writers, which is in turn essential for understanding their message. In other words, things that don’t make it into creeds can be crucial for grasping biblical theology. When Unseen Realm gets into subject matter that can’t be found be found in a creed, those items should not be off-handedly considered peripheral. Part of the problem with creeds is that every one of them is historically conditioned. Creeds are formed in response to some problem or need. That contributes to their incompleteness. They are statements of faith and doctrinal conclusions that, presumably, their creators can justify through exegesis of the biblical text. My interests and, ultimately, theological loyalty, are attached to the latter, not the former. It’s just an issue of priority. What do you mean by “supernatural” and “supernaturalism”? I’m well-acquainted with the pros and cons of using the word “supernatural” in the book. But I wanted to spare people the academic discussion. This is a book I wanted people to read, not a dissertation. For that reason, I’m using these terms to talk about that which is divine—i.e., not part of the human realm or the natural realm. I realize that, since angels and demons are created beings, they must be made of something because there can only be one uncreated being . . . and that angels and demons might be from another dimension of reality – and so angels are demons might be thought of as natural (i.e., material), making supernatural an imprecise word. While I’m well aware of those points, I’m also acutely aware that readers would yawn right through such a rabbit-trail. I chose the terms to distinguish the normative realm of human experience from the presence and activity of beings that most people don’t associate with the physical limitations of our realm. It’s no more complicated than that—and it need not be for the purposes of this book. Chapter 2 hits on several crucial items that if misunderstood will result in erroneous and skewered perspectives on The Unseen Realm. These points are, in my mind, adequately telegraphed in the book, but some extended commentary may still be helpful to some. The biblical writers and those to whom they wrote were predisposed to supernaturalism. To ignore that predisposition in Bible interpretation will produce interpretations and conclusions that reflect our mindset more than that of the biblical writers. These ideas are fundamental to the purpose of the book. On one level they are self-evident. On another, they raise this question: How much of what biblical people believed about the supernatural world and its intersection with our world do you really believe? The question will be uncomfortable to many scholars and Christian leaders, but probably less so to “ordinary” readers. Those in the vocational academy and trained in that academy quite readily (some, eagerly) find explanations of passages that de-mythologize a passage (i.e., strip it of its supernatural content or assumptions) thereby producing interpretations that are palatable (i.e., less offensive) to the modern mind. But the inevitable result is that such interpretations aren’t the way a biblical writer would think about that passage. Is this disconnect permissible for those who say they hold a high view of Scripture? To put the above question another way: How much of what a biblical writer believed about the spiritual world do you feel comfortable dismissing? These are the sorts of questions that never quite make it into inspiration and inerrancy discussions. The question would usually be dismissed as hermeneutics. But let’s be honest—it isn’t synonymous with hermeneutics; it’s only related. The questions are germane to a discussion of the authority of Scripture. If Scripture isn’t authoritative for truth about the supernatural world, what’s the point of assigning sacred status to it? 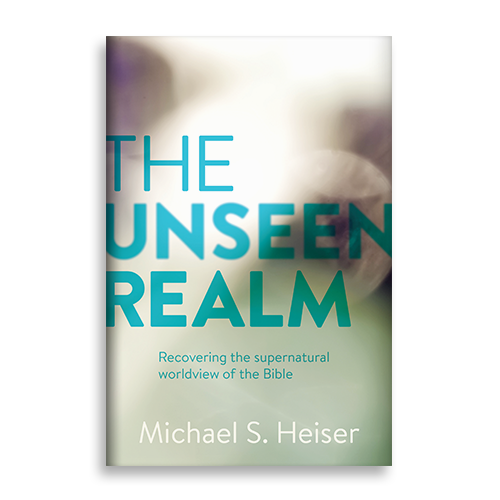 What I’m doing in Unseen Realm is to point out that what Scripture says about the supernatural must be ascertained by keeping it in its original context—not superimposing a later, more “rational” context on it for our own comfort. I’m not sure how we submit to its authority in such matters when we resist doing that. But that leads me to my purposes for the book. What I’m trying to do in The Unseen Realm is to get the worldview of the ancient biblical writers and their immediate audience into the head of the modern reader. The purpose on one level is to help people see Scripture through ancient eyes—eyes that were predisposed to an active supernatural world that overlapped with our own in many ways. I want to challenge readers that, without letting that worldview drive the bus of interpretation, our biblical interpretation will be flawed in both small and significant ways. I also want people to re-experience the thrill of discovery in Bible study. On another level, I hope to get the uncomfortable questions out in the open for discussion. There are sub-questions that need to be part of that. For example, if an interpreter thinks a biblical writer put a “supernatural spin” on an event, is that an interpretation that doesn’t dismiss the writer’s supernaturalism? Maybe, maybe not. But let’s talk about things like that—without separating them from the matter of biblical authority. That sub-question is related to (but again, not synonymous with) my statement in the book that I’m not claiming that the most supernatural interpretation is always the best interpretation. For me, the best interpretation of odd passages or those overtly dealing with supernatural content is one that: (a) doesn’t sidestep the supernatural for comfort’s sake; (b) informs other strange passages; (c) is consistent with the supernatural worldview of the ancient context that produced the Bible. These three criteria won’t always be met the same way—but I contend they need to be met. As readers will note, I don’t think that many refined modern interpretations produced by scholars meet these criteria. Many popular modern interpretations would be foreign to the thinking of people in the biblical world, including the biblical authors. I don’t think such a result is coherent. Does Dr. Heiser believe the earth is flat? I couldn’t really figure out where to put this one, as it concerns my writing on ancient Israelite cosmology. I mention cosmology in Chapter 37 in a footnote (and nowhere else in the book, really), so I decided to put it there and here, as Chapter 2 talks about ancient Near Eastern contexts.